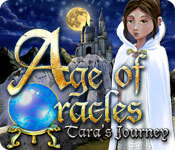 Age Of Oracles: Tara's Journey is a hidden object game in a tarot-card inspired fantasy setting. This page shows the fantasy art for all the tarot cards in the game. Age Of Oracles: Tara's Journey features a deck of Tarot Cards with a variant Major Arcana. The Major Arcana cards are typically The Fool, The Magician, The High Priestess, The Empress, The Emperor, The Hierophant, The Lovers, The Chariot, Strength, The Hermit, Wheel of Fortune, Justice, The Hanged Man, Death, Temperance, The Devil, The Tower, The Star, The Moon, The Sun, Judgement, and The World.